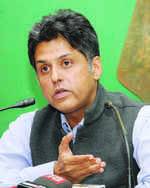 The Congress tonight cleared the candidature of former Union ministers Manish Tewari from Punjab’s Anandpur Sahib Lok Sabha seat and Kumari Selja from Ambala in Haryana. The party’s central election committee chaired by president Rahul Gandhi met this evening to decide the four pending seats in Punjab and all 10 Lok Sabha segments in Haryana. The committee is learnt to have cleared two candidates in Punjab — Manish Tewari from Anandpur Sahib and former MLA Kewal Dhillon from Sangrur. With this, the Congress has fielded two Hindu faces — Tewari and Sunil Jakhar — in Punjab. Four candidates have been cleared for Haryana — sitting MP Deepender Singh Hooda repeated from Rohtak; former minister Selja from Ambala; state president Ashok Tanwar from Sirsa and state legislature party leader Kiran Choudhry’s daughter Shruti Choudhry from Bhiwani-Mahendragarh. Shruti was the MP from the seat in 2009. A formal announcement on the nominations will be made soon. Tewari, who had applied for the Chandigarh seat, was accommodated in Anandpur Sahib after days of suspense over his nomination. The state screening committee had earlier given his name to the central committee for Anandpur Sahib but Rahul had kept the seat pending. With Punjab Chief Minister Capt Amarinder Singh and AICCin charge for the state Asha Kumari along with majority leaders in the CEC backing Tewari, his nomination was cleared tonight. Tewari was Ludhiana MP in 2009 and had not contested the 2014 Lok Sabha elections on health grounds. Dhillon’s nomination from Sangrur had the backing of Captain Amarinder and former Congress MP Vijay Inder Singla. Awaiting the Akali Dal’s strategy, the CEC has kept its decision on Bathinda and Ferozepur seats on hold. “We will wait and see if Shiromani Akali Dal president Sukhbir Singh Badal will contest from either of the two seats,” said an AICC source, adding there was no hurry since the elections were slated for the final phase i.e. on May 19. The party had earlier announced nine candidates in Punjab. In Haryana, the four names cleared today were along expected lines and the decision on the rest will be taken soon, said sources.